I’m a bit late on this story, but on Tuesday, the Greek Culture Minister, George Voulgarakis issued a statement calling an antiquities ring investigation one of the most “complex in recent memory”. 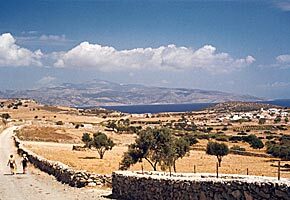 The bust came on the small island of Schinoussa, pictured here. It’s one of many islands in the Aegean, which has historically had some notoriety for being a haven for pirates and other criminals. The original discovery came in April of this year. There are indications that this investigation may have some links to the trial of Marion True, who is on trial in Rome on charges of conspiring to traffic in stolen antiquities. The raid turned up a wealth of objects, including the ancient, early Christian, and byzantine eras. The owner of the villa is Despina Papadimitriou, a member of a prominent Greek shipping family whose late brother, Christos Michailidis, was an antiquities dealer. Another house was searched, on a neighboring island,which was owned by Marion True. The outcome of this investigation remains to be seen. However, it does reiterate, at least anecdotally, the size of the illicit market in antiquities.